Noooooo!!!!! And I had even told the cashier at Kohl's to check for those!!!! I knew many of the clothes I purchased would be going straight into my suitcase when I got home. Jim thinks I should wear it anyway since it it underneath the bottom layer of the dress, but I'm worried I will set off some alarm:)!!!! My plan now is to just return it when I get back home:( Big bummer!!!! UPDATE: I was determined to get that thing off!!! First, I went to the hotel gift shop to see if they had any security tags on their items, which would mean they'd also have a way to remove them. Nope! So then second, of course I googled it. I tried the rubber band technique because I had a bunch of hair elastics with me. One elastic was all it took to loosen the screw significantly, and I was pretty certain there was no ink inside it, so I wasn't stressing about pulling it apart with all my might (which sadly wasn't enough might). All of my tugging put a tiny little hole in the dress, which is okay because it's on the inside layer that gets covered up anyway. 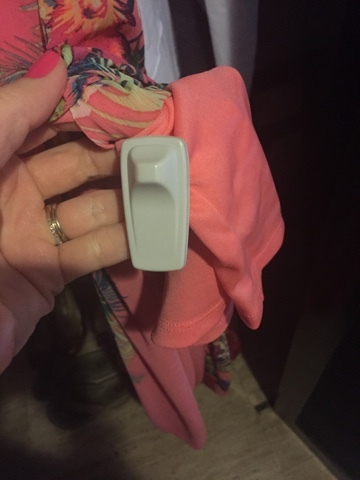 I was able to gently stretch that little hole around the security tag and get it off! It's close to the seam, so I can stitch it up if I later decide I need to, but it doesn't show, and I'll probably never get around to it!! Problem solved!! !